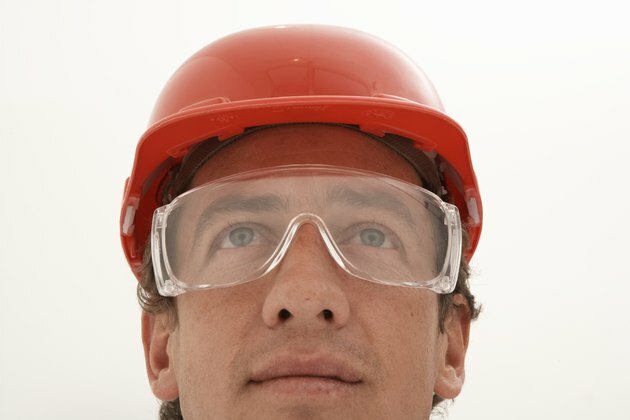 If you ski, swim or perform home-improvement projects, you will likely want to wear goggles to protect your eyes from debris or harmful chemicals. Unfortunately, goggles often fog up, making it difficult to see and interrupting your activities. However, you can quickly and easily defog your goggles and prevent them from fogging up again by washing the lenses and applying a thin coat of dishwashing liquid, baby shampoo or commercial defogger spray. Place the inside of your lenses under a steady stream of running water for a few seconds. Remove the lenses from the water and, without drying the lenses, apply two or three drops of dishwashing liquid or baby shampoo to the inside of each lens. Spread the dishwashing liquid or baby shampoo evenly over the entire surface of each lens with a lint-free cloth. Rinse the lenses under running water until the dishwashing liquid or baby shampoo has dissipated enough so that no bubbles or film remains on the lenses. A thin coat of the dishwashing liquid or shampoo will remain on the inside of the lenses; the chemicals in these items will prevent the buildup of humidity, thereby eliminating fog. Wash the lenses of your goggles with running water and dry them completely with a lint-free cloth. Shake a canister of commercial defogger spray to mix the chemicals in the spray. You can buy defogger spray at major retailers of sporting goods. Hold the canister 4 to 6 inches from the inside of your lenses and apply an even layer of defogger spray to each lens. Allow the defogger spray to dry for approximately five minutes. Reapply after a few hours of use. You can also buy no-fog sports goggles at most major sporting goods stores. If your goggles fit over your nose, breathing through your mouth will help prevent your goggles from fogging up.